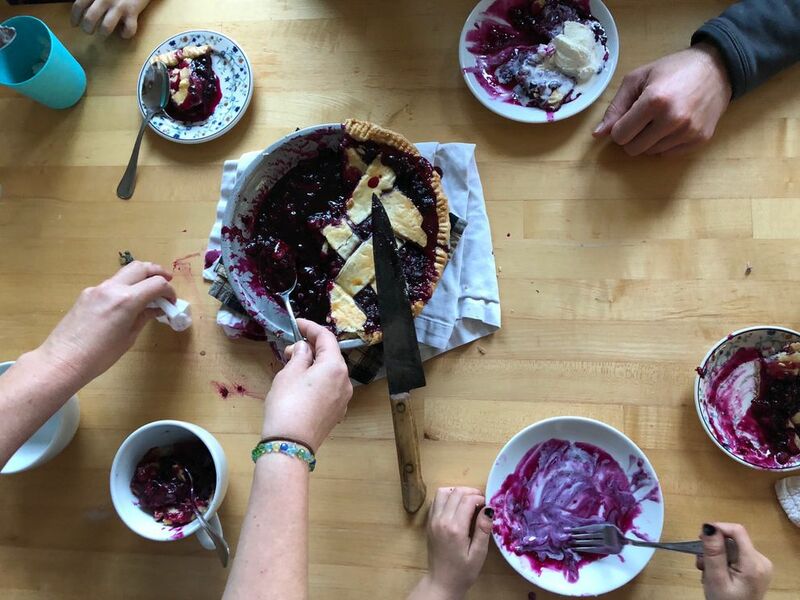 What is it about eating pie from berries you picked yourself in late August, when the coho are running and there's a giant cabbage weigh-off at the fair? Does it taste a little better? Blueberries are one of the most widely available wild berries in the state, a subsistence food and a staple of the earliest kitchens. 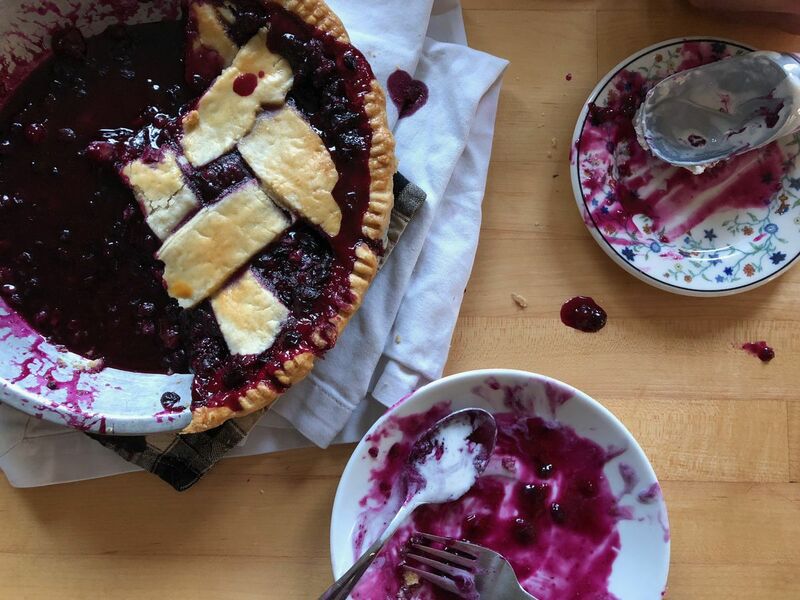 Inky-blue wild berry pie is a quintessential Alaska food. I come from pie-making people. My Uncle Tommy, a pie-baking champion from Girdwood, is known in certain circles as "His Pieness." I'm not a gifted pie baker despite watching great pies being baked a thousand times. But, still, I was determined to write a recipe that is both awesome and hard to mess up for those not naturally inclined. 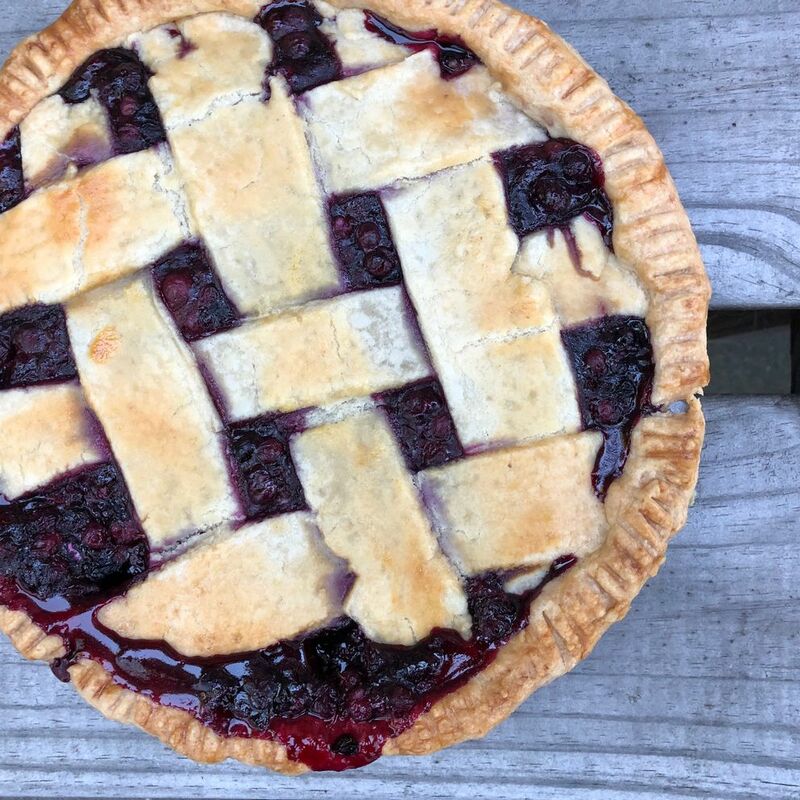 Every Alaska cook should have a pie recipe up their sleeve. And this is now mine. This one has two unorthodox aspects. The first is that I make the crust using a food processor. Tommy would never approve, but when I do it in the processor, I just like the dough better. The second, which comes straight from His Pieness, is that I use tapioca flour to thicken it. Bob's Red Mill makes tapioca flour and it's available in a number of grocery stores in Anchorage. It makes the pie set up just right. But, of course, that means waiting for it to cool. (Which we sure didn't do in the pictures.) You can also use corn starch, regular tapioca, potato starch, arrowroot or flour. Meanwhile, put the berries, sugar, zest and tapioca in a large bowl and mix. If you like, let it sit and macerate a bit while your dough chills. When you're ready to make pie, use a standard 9-inch pie dish and preheat the oven to 350 degrees. On a floured surface with a floured rolling pin, roll out the bottom crust. Fold it in half and the in half again, lift it into the pan than then unfold it. Fill it with the berry mixture. Do the same procedure for the top, or, if you like, cut the dough into eight fat strips and arrange in a basket-weave or lattice pattern on top, crimp the edges with your fingers. Brush with beaten egg. Set the pie pan on a sheet pan to catch any overflow. Bake for an hour and then have a look at the pie. The filling should be bubbling out of the top crust and the crust should be golden. It may need as much as 10 minutes more bake time, depending. The pie sets as it cools. (If you can wait that long.) Serve with ice cream. Julia O'Malley is working on a book at the Anchorage Museum about how Alaskans eat. Part of the project involves researching, testing and writing "Alaskana recipes" for dishes commonly made in Alaska's kitchens. You can sign up to receive her weekly Alaska food newsletter, "How Alaska Eats," in your email inbox by visiting adn.com/newsletter. Find more classic Alaska recipes here.